Can Computer-Based Assessment Model Worthwhile Mathematics? Several weeks ago, Dan Meyer described his experience of completing 88 practice sets in Khan Academy’s eighth-grade online mathematics course. His goal was to document the types of evidence the Khan Academy asked students to produce of their mathematical understanding. Dan’s findings were disappointing: He concludes that 74% of the Khan Academy’s eighth-grade questions were either multiple choice or required nothing more than a numerical response. By contrast, Dan notes that the Smarter Balanced Assessment Consortium (SBAC) has a stronger focus on questions that ask students to “construct,” “analyze,” and “argue” as a way to test their understanding of Common Core mathematics. A Khan Academy diet of multiple-choice items and numeric answers would seem ill suited to helping students prepare for the types of mathematical reasoning expected by the Common Core. Dan’s comments about the difficulty of authoring rich, computer-gradable mathematics tasks reminded me of work that Steve Rasmussen, Scott Steketee, Nick Jackiw, and I undertook several years ago. We set out to discover whether Sketchpad could deliver assessment items that would engage students in dynamic mathematical models and have them demonstrate their understanding through their interactions with the models. Starting with this blog post and in the next two or three to follow, I’ll share some of our assessment ideas. I’ll state upfront that our examples are not revolutionary—these are mathematical tasks that are several notches above numerical answers and multiple-choice responses, but they’re still based on traditional content. Nonetheless, they are representative of what can be done now with Web Sketchpad, and they point the way to more ambitious possibilities. 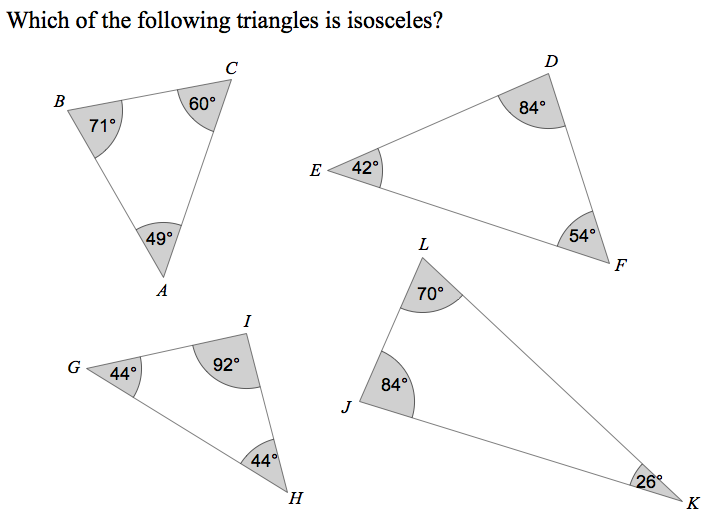 I’ll start with a question that assesses students’ basic understanding of isosceles triangles. Read the multiple-choice item below. It’s a straightforward question, and if a student knows the definition of an isosceles triangle, there isn’t any thinking required. Indeed, even if a student knows nothing about isosceles triangles, she might still pick the correct triangle, as only one triangle visibly differs from the others in having two of its angles equal. Now, consider the assessment task below. It again centers on the fundamental definition of an isosceles triangle, but it is different from its static counterpart above. Rather than pick which of four triangles is isosceles, students are given a single triangle—one whose lengths and angles can be changed by dragging its vertices—and are asked to make it isosceles. The multiple-choice question had just one right answer; this dynamic version yields numerous solutions. Any isosceles triangle the student creates, whether it be one with angle measures 2°, 2°, and 176° or 50°, 50°, and 80°, counts as correct. When compared to the passivity of identifying an isosceles triangle, the engagement required to make an isosceles triangle feels like a step up on the assessment ladder. But with better assessments comes the question of how we should grade them. The multiple-choice version is clear enough—a student’s answer is either right or wrong with no room for partial credit. But grading the dynamic version is thornier. Answering the question requires a student to use a mouse, a trackpad, or perhaps her finger to position the triangle’s vertices. Try this yourself with the Web Sketchpad model above. It can be surprisingly tricky to get the triangle’s angles to match the values you have in mind! The motor skills needed to adjust the angles precisely led us to factor in some forgiveness to the scoring, shown below. 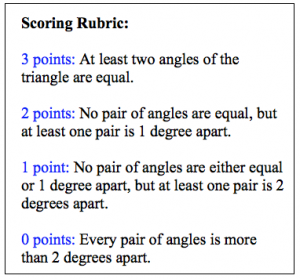 If a student drags the triangle so that two angles are either 1 or 2 degrees apart, we award him partial credit and the benefit of the doubt, assuming that his unrealized goal was to create two congruent angles. Will Common Core curricula commit to making computer-based constructions a part of their content? Can teachers devote enough time to such construction tasks so that students are prepared for them when assessed? Can we find a way for computers to grade construction tasks? I’m curious to hear what you think! Nice bit of dexterity needed to make an equilateral triangle! Also a hidden nicety is to show the score while dragging the points around, discussing why the score is what it is! Hi Ken–Those are good observations. The equilateral triangle does require some very precise dragging! And I like the idea of making the score visible while dragging the points. Love this series. That rubric is such an interesting marriage of technology & pedagogy. I like the technology conceptualization of the problem, but when I look at the difficulty level of the question itself, does the technology really enhance the problem any? The student is still just using recall of the definition of an isosceles triangle to come to the same conclusion. At one point, I had the score on and just watched it as I moved my finger til I got a 3. I never looked at the numbers themselves, just focused on “getting it right”. In no way should my comments be thought of as negative, because I sincerely think higher order thinking can be assessed in this manner. I think this is just the tip of the iceberg and I look forward to future developments. Thanks for your comments. 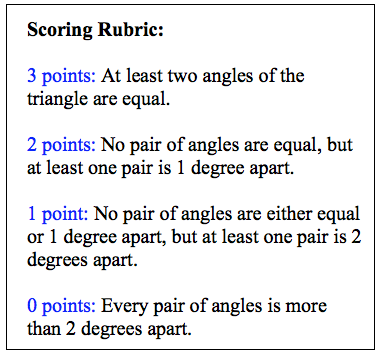 I should clarify that were this the actual assessment, I would not provide students with the ability to keep the score visible while dragging the triangle’s vertices. Perhaps I should have modified the model so that when the score appears, the triangle’s vertices are hidden, thus making it impossible to drag the triangle. I agree this is the tip of the iceberg. In fact, I have a completely different isosceles triangle activity that goes way deeper than this assessment task. It, too, is Sketchpad based, and I hope to describe it on our blog soon.